This is the international reverse engineering challenge conducted by U.S based security company. The purpose of this challenge is to evaluate the effectiveness of software protections. The results of this effort is used to improve the protection measures used in the softwares. The contest is carried out in 3 phases where first and third phase involved breaking the protection of custom programs by using reverse engineering. The interesting part of this reversing challenge is the usage of floating point computations. For more details on various phases and the rules, visit the Hacker Challenge website. Reverse engineer the mathematical formula that results in the value "10.9319" of the output. Remove the limitation on an input data field of the code so that values greater than 210.5 are treated the same as values less than 210.5. I have put together the problem, solution and detailed report at Hacker Reversing Challenge Phase I page. Phase III of this reversing challenge involved the similar program but it was more difficult than the program at phase I. It also had floating point operations, but protections mechanism were implemented in much better way compared. Also some lesser known anti debugging techniques were used. Reverse engineer the mathematical formula that results in the value "-59.0079" of the output. Remove the limitation on an input data field of the code so that values of 200 or greater are treated the same as values less than 200. I have written detailed description on the solution which will help you in understanding and solving the problem. 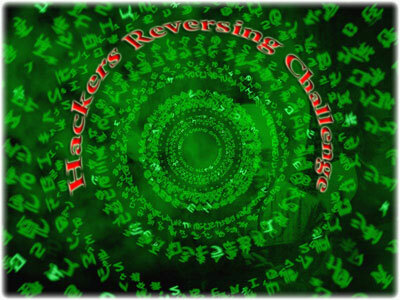 You can find it on Hacker Reversing Challenge Phase III page. All together it was interesting challenge worth trying out especially for the reversers who have crossed beginner level. If you have already tried it and left it in the middle, then you can look at the detailed solution(follow the above mentioned links for respective challenges) and finish it off..!